While everyone is hoping for super-fast speeds from the UK's athletes at the London Olympics, experts are warning that internet speeds may not keep pace. Already hailed as the "Twitter Games", many are predicting a deluge of data as events get under way. It has led the Internet Service Providers' Association to warn of a "massive hit on the infrastructure". Businesses could struggle with bandwidth if they allow employees to watch the games at work, it said. ISPA member James Blessing said that businesses allowing employees to watch streamed content could encounter problems. "The average connection speed for small and medium business is unlikely to allow every employee to stream the Olympics to their desk," he said. Olympic planners have reportedly already told London businesses to prepare for sluggish service during the Games or even interruptions in some severe cases. There has been some talk of rationing data, but Mr Blessing ruled this out. "Service providers are not expected to cap data use but may use technology to manage the network at peak times to prevent access from stalling completely," he told the BBC. Vodafone said it was going to be a struggle to keep up with the demand for mobile data. "This summer it's going to be the equivalent of England playing in the World Cup final on Christmas Day, every day for the 17 days of the Games," said a spokesperson. One of the biggest bottlenecks for the Games will come as a result of users seeking updates via their smartphones. To ease congestion, BT is installing 25 phone masts across the 500-acre park in order to provide maximum capacity for those attending the Games. Mobile operators are also boosting their coverage in public spaces such as London's Hyde Park. 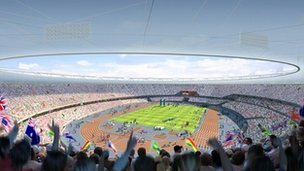 O2 said that it has ploughed £50m into Olympic-related projects. The huge amount of video being streamed live to the internet by the BBC is another concern. The corporation plans to provide live coverage from up to 24 locations to sit alongside its three main channels of edited content. It said it would be prepared for a potential maximum of one terabit of traffic per second at certain times - the equivalent of 1,500 people downloading a feature-length DVD every minute. "The BBC has expanded its streaming capacity to deal with any traffic increase at peak moments during the Olympics," it said. Unlike the athletes, the technology firms helping the Games run smoothly, want to stay out of the limelight. "Demand will depend on how well the British squad performs. Hopefully, no-one will notice a thing, for us that's a victory," said Mr Blessing.